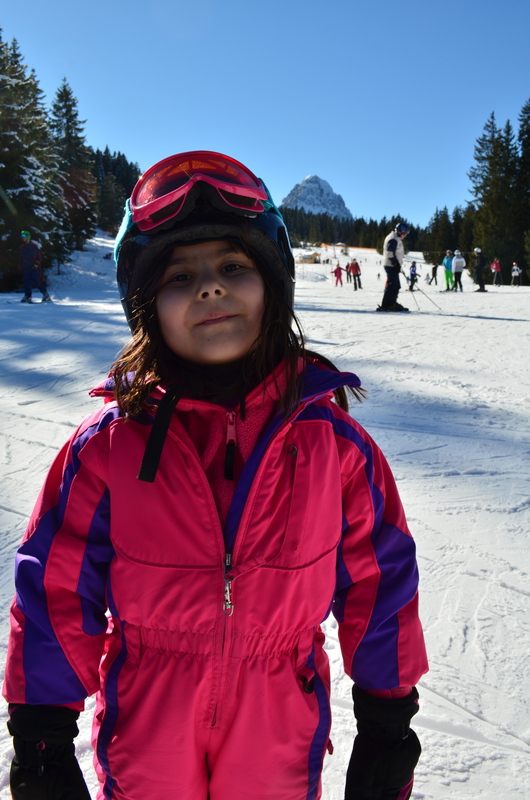 It was the first day of ski school and I watched from a distance as my 5-year old daughter, Maggie, lined up with the other girls and boys her age, wearing skis (some for the first time). From my bird’s-eye view on a sunny balcony, the training hill appeared as an island of manmade snow surrounded by green grass. Marooned adults and children stood tightly packed for their first day of lessons. There was a good deal of confusion, kids crying, adults looking anxious and awkward. It didn’t seem like Maggie was learning much of anything. I wondered if I should have paid the extra money and hired a private teacher? I waited, watching the herd of children sidestep their way to a rubber mat leading to the towrope. They looked like newly born calves on still wobbly knees. It was a slow procession. One step forward and whoosh a long slide back. Maggie lifted her skis, left then right, making little progress when whoosh she too slid backwards, only she continued down the hill, landing in shallow gully, feet and arms flaying overhead. She remained like a pill bug turned upside down, no way of getting upright, until several minutes later when the instructor rescued her. This time he carried her straight to the towrope (no more sidestepping) and showed her how to grab hold. She whizzed up the hill, miraculously staying on her feet. What was she going to do when she got to the top? There was another instructor waiting who plucked her off the line. She positioned Maggie facing downhill—a good start. Her legs were straight and wide, her arms out like airplane wings. She began her descent, picking up speed and was soon careening into a large group of skiers who luckily saw her coming and parted like the Red Sea. She passed unscathed then seconds later landed in a spectacular crash. I wanted to rush down, be a ‘Snowplow’ parent that smooths the way, pick her up, give her a hug, brush off the snow and cheer, “Good try,” but I didn’t. I knew I’d send the wrong message. I didn’t want her to think she always needs me or that she couldn’t fall and get up on her own. This was a chance to learn independence. While I’d imagined a kinder, gentler approach to skiing, this “tough love” approach to ski school did have it’s merits. A few more crashes like those and I assumed Maggie would find a way to stay upright. At least she wasn’t crying. Plenty of other kids were and by now the instructors had the gigantic vinyl “ice cream bench” sitting on the ice, a cone shaped foam chair for kids. I wondered if Maggie might take a seat following her crash landing, but she didn’t. She got back up and sidestepped it to towrope. I even saw a smile. After five hours on the slopes, the fun was long gone. When I picked her up from class Maggie clung to me like a bear cub to its mother, saying, “I don’t want to go back there tomorrow.” She was exhausted from the physical exertion at the higher altitude. I couldn’t blame her. I knew how she felt. Hadn’t there been things in my life I never wanted to do again? Should I make her continue? The problem was, I knew ONE day of ski school wasn’t enough. All she’d learned was that ski boots are uncomfortable and it’s miserable being out in the cold for five hours. She had to go back. She had to figure out this was going to be okay. The next morning we went to breakfast sans ski gear. I figured it was better to wait until she had something to eat before announcing where she was going. On the plus side, she’d met a couple of girls her age in class and really liked them. (They weren’t whiners or criers.) When I mentioned after breakfast how nice it would be to see them again, she immediately picked up on the clues. “I don’t want to see them again,” she countered. It wasn’t personal. Seeing them again, meant she was going back to class. “Let’s just go inside and check and make sure they’re still having class,” I said, leading her from the car to the lodge without too much protest. Once past the front desk and up the stairs I said, “Yep, everyone’s here, looks like they’re still having class.” She frowned and glared at me, her legs going stiff so it was slow going that last 5 yards to the locker room. By now other ski schoolers were gathering and I used that to my advantage. “Oh look, there’s Olivia. Don’t you love her pink scarf?” I could see Maggie trying to keep a good face in front of her peers. I helped her on with her gear: boots, gloves, helmet, and bib number and we funneled into a room filled with other anxious kids and parents, waiting for class. A movie was playing and Maggie stared at the screen. A few minutes later, it was time to leave and she turned to me with a look of panic. Just then the instructor announced, “We’ll be riding the cable car up to the big mountain. We won’t be eating at the lodge so everyone will need to bring their own lunch money.” I tucked a 10 Euro bill into Maggie’s front pocket. She beamed. The prospect of having her own REAL money, as it turned out, was more important than being scared. She kissed me goodbye and with a prayer in my heart I waved her off. I spent the next several hours trying not to think of my baby falling down the slopes. I tried to relax and ended up in the gym working out then sitting in the hot tub. I didn’t want to hover, but it was hard. I especially didn’t want to show up prematurely and have her see me and ask to go home. A little before the 2:00 pick-up, I rode the cable car up the mountain and hiked to where I knew they were skiing. I tucked myself behind a massive pine and spied on her as she rode the seated towrope up the 50-meter slope. It was surreal. Not only did she make it all the way up, but as she skied down, her legs were in a more natural position, and her arms by her side (no longer wings). Her face was red with exhaustion, but she looked confident. She was doing it! She was actually skiing. For the rest of the week things only got better. By day three she was taking the chair lift and running the Blue Courses. 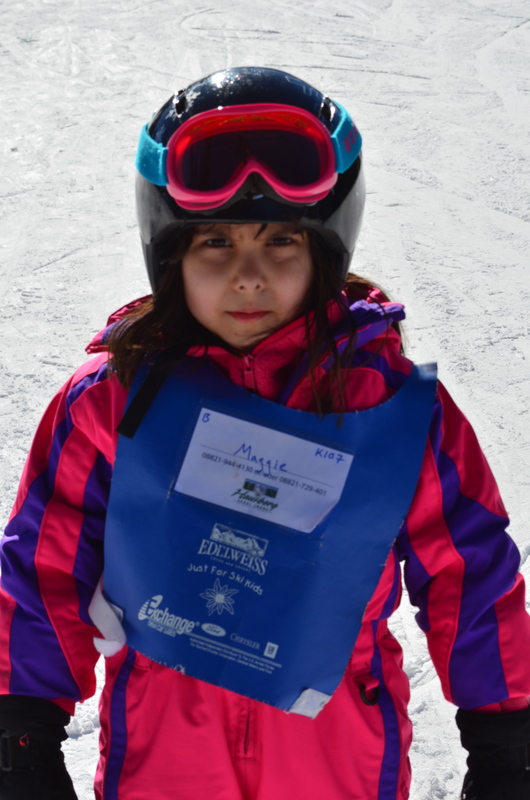 In less than a week Maggie had become a better skier than me (okay, maybe that’s not saying much, but still). 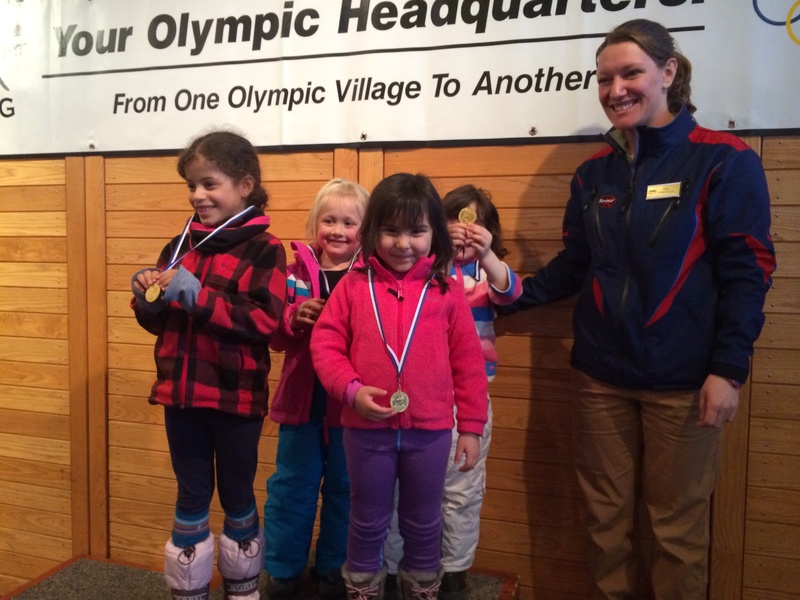 She earned her medal and took first place (along with everyone else) as the fastest skier. Learning to ski or learning to overcome adversity, it’s pretty much the same in my opinion. If you can get up from a fall, brush yourself off and keep making your way up the mountain then you’ve got a formula for success not only on the slopes, but in life too. Perseverance is a skill you learn by failing. Once you have that lesson down, it’s a whole lot easier to keep getting up. Just love this and your brave, brave girl! Now, can she show my guy how to ski? I was impressed how tough she was to go back to the ski lessons ..watching her walking with the heavy ski with the class. She was the littlest one ..but became the best skier in the end my boys said! I remember now my mother used not to help me up right away when I fell down on the ground when I was small but watched me get up close and praised me after. I did the same to my boys when they were younger. Thank you for this post to remind me the important lesson in life. So glad Bruce filmed that short video of her skiing. Priceless memories!! She really did go through a lot. Her ankle was even bruised but she kept going back. Love her. The pillbug image–priceless. When my children were little, I wanted the world so very gentle to them. When it wasn’t, I explained to them about tough love, but wished life was kinder. Now, they’re adults, and I am so thankful for the rough lessons. They are great, self-reliant, independent. You are a wise mother. It must feel great to look back and see indeed that everything turned out all right. Those tough lessons are worth it. And you wrote a book about your daughter. Amazing!! Thank you!! Lana, you are such a great mom! I often wonder if I interfered a little too quickly on some things when my children were younger. I definitely believe that in doing hard things, characters are built. Love the post! While reading I could feel (at a cellular level) Maggie’s apprehension, but even more so, YOUR inner conflict. Way to go, both of you! Maggie will grow up a woman of strength and conviction, just like her mama. I know you know my Maggie girl well so you totally get this moment, right? It was a tough time to go through (bruises and all) but she did it (and I did it) and we both learned.